Do you know the history of this Old Hyde Park block? Today’s slideshow features the 3400 block of Broadway and Central, as well as the blocks of Armour Boulevard and 34th Streets between Broadway and Central. The area includes the historic Ellison Apartment Hotel at 300 West Armour and Warwick Cleaners at 3421 Broadway. You’ll also see the Hollywood Café and Standard Service Station on Broadway. Along Central Street, a number of small frame homes housed families in these 1940s photos. 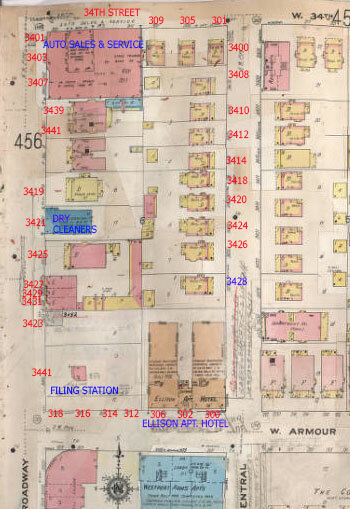 This Sanborn Fire Insurance map (right) shows the homes, businesses and apartments as they stood around the time these photos were taken. The slideshow at the end of this post shows all of the buildings that existed when the 1940 tax photos were taken. 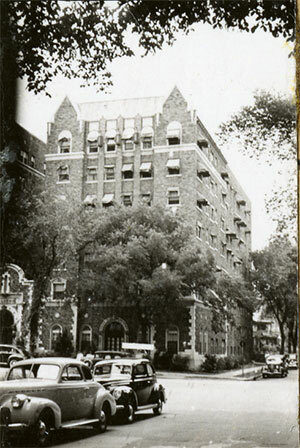 The Ellison Apartment Hotel at 300 West Armour in 1940. Ty for the pictures and history.It has been thirty years since I lived in kcmo.I grew up in a nice neighborhood on between 59th and main and Troost.fine,beautiful houses there. Growing up in midtown in the 1950s, I recall the Rexall/Crown drugstore at Armour Blvd. and Broadway. It was across the street from the gas station. It had the beautiful circular marquee pictured in your slideshow. It was a handy little drugstore with parking surrounding the side and rear of the building. It competed with the Katz Drugstore at 39th and Main. Armour Boulevard was a beautiful street and one of the shorter boulevards in KC, stretching straight east/west from Paseo Boulevard to Broadway.